Why do I love Saipan? If I had to sum it up in a word, my word would be "beautiful". Saipan is truly a beautiful island with a lot to offer. I have lived here since 1996 and still never tire of the scenery. Great views are everywhere, whether it is the beaches, mountains, or jungle and all are close to home. Even after all these years I still find, and enjoy learning about, new places in Saipan. The history of Saipan is as rich as its beauty and never-ending. That is my hobby and I would like the world to also enjoy Saipan's beauty and history. 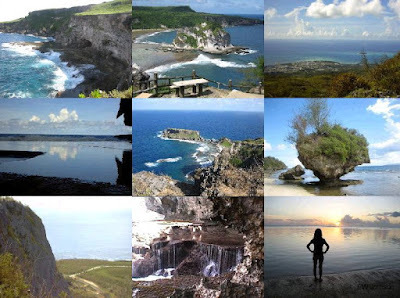 Although great views can be found everywhere in Saipan, click the picture above to see some views that I found amazing. Thank you and keep Saipan beautiful! well, the man in this photo, looks like an actor in the tv show, battlestar galactica. NIce place. I love to go there. Your photos are absolutely stunning! I am amazed at the historical images you are privy to. Thank you so much for sharing them and thank you for rendering this beautiful gem (Saipan) to the rest of the world. we had a band called "forbidden boyz" named after forbidden island. we used go there and bar-b-Q alot. We just returned from a week trip to Saipan. 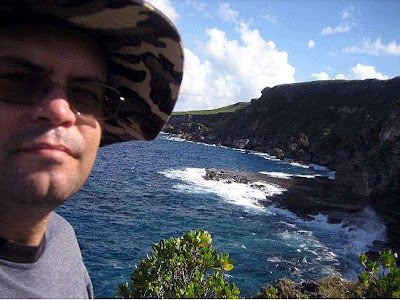 Wow, you've done an incredibly thorough job documenting Saipan through your posts and your photographs. The photography is quite good. We didn't have a chance to do any caving, but it must be amazing. Question: When you find human remains, are those turned into anyone for DNA testing? I know there are thousands of Japanese soldiers (and a some US soldiers) still MIA. Is there anyone still actively trying to identify remains in order to provide closure for families? Or has it just been too long...? Thanks CS. For decades after WWII a Japanese organization would return to collect and cremate the remains found. I am not aware that they returned since I've been here. My estimate is a total of 57,000 died in the three week battle and there are still so many in the caves and just below the surface in the jungles. I don't think any DNA testing was ever done. How is the health system? What was the biggest adjustment to living in Saipan? I'm a college math instructor. Health care is not good here. Hi Johnson. I was googling about Saipan and just found your blog. I almost couldn't recognize you. I was your student for ma132 about 7 or 8 years ago at NMC. BTW, you have many beautiful photos in your blog..especially the one on the center of the third column(isolated mushroom like rock). Where is that place? I'd never been there in my life of 17 years in Saipan. Can you please tell me the exact location? It was good to see you here again. Hi Choi. That is at Obyan Beach but requires a little walk to get there. My husband & I were in Saipan from 10/92 to 12/94. I was reminiscing when I found your blog. Love the pics and information you provided! We were there when they installed the first stop light ! (Are there more now?). Been there and seen most of the places you described. Met some wonderful people there too! EW- WOW!! What a truly amazing place and your blog is by far the most informative that I've been able to find. I am an old marine, drawn to this island for multiple reasons. Are you still living on Saipan? It would be an honor to be able to meet and perhaps explore the area.